Well I have just received my first Victorian Truncheon to start my collection off. It is by a company called Hebbert & Co London, and also stamped into the rounded end on the handle is W D with what I believe is a pusser's arrow between the letters. Hopefully someone can tell me a bit more about the Truncheon. I also have a J Hudson & Co whistle........a small start, but at least I've finally started. Well done Tim.....getting started is easy...its stopping thats a problem!!!! Now I know nothing about truncheon's but it sounds like it comes from the Royal Woolwich Dockyard (WD), it established its own police force in 1834 to counter corruption in the detection of theft and idleness. This had been subsumed into the Metropolitan Police in 1841 and in 1846 comprised a force of thirty-nine men, of whom twenty lived on site. 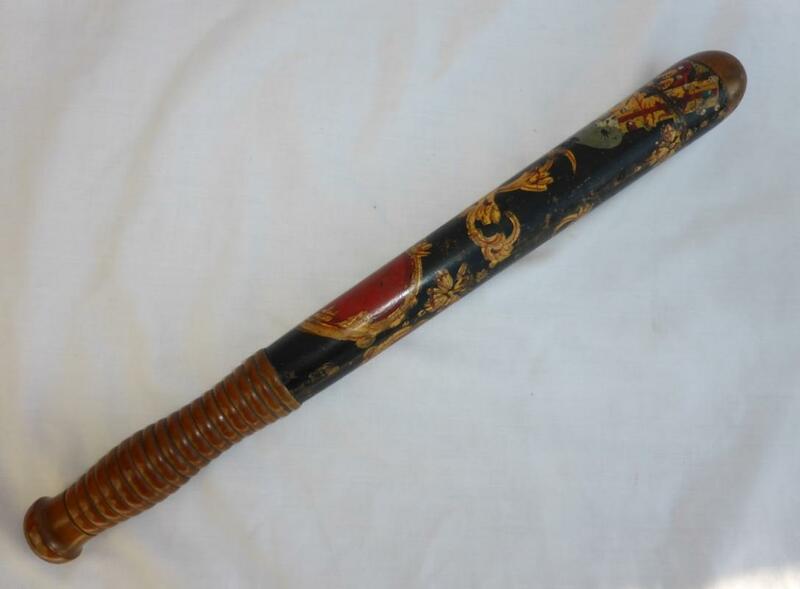 I am sure that someone on here will provide further information.....if you are lucky it could be from the original dock force cos I'm not sure if the Met had such fancy truncheons? The other thing is about Hebbert & Co was that there were three Hebbert & Co. first is Isaac Hebbert & Co 1827-1828, later was Hebbert & Co Ltd 1829-1832, then Isaac Hebbert & Co Ltd 1833 -1852. So if you know the makers name format, that may also help the experts on here as they were military sword makers for a very long time. I have also found another W D with a pussers arrow in between, near the tip of the truncheon as well. 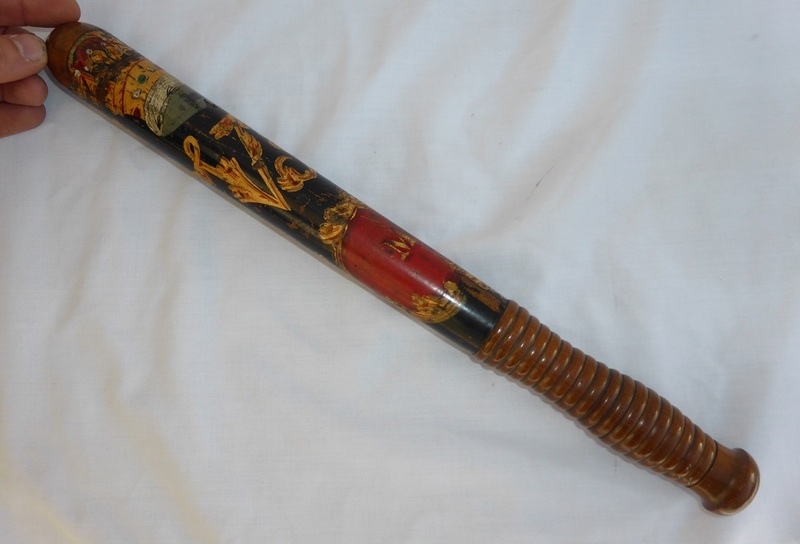 I look forward to any further info on this truncheon. WD with the broad arrow between it is the mark of the War Department - nothing to do with Woolwich Dockyard I'm afraid. a similar , smaller, size for an Inspector. a truncheon in times of riot - but few examples remain today. and see who they were issued to ? Sorry Meryyn, but I'm going to have to stick to my guns here - it is inconceivable to my mind that any form of marking to a specific dockyard would be allowed that EXACTLY mimicked an already well known and well established military marking. It would defeat the original point of creating a mark that clearly denoted that an item was military/Government property. I can offer further evidence in that I myself own a very similar truncheon. 17 inches, marked Field on the end, with the 59 Lemans Street address that dates it to 1877 or very soon after. It is unpainted now, but there is evidence to suggest this may have been stripped off at a later date. Just above the grip it has been stamped K over 552, which would mean it was originally for Stepney if it is a Metropolitan Police truncheon. Like the original posters truncheon, the address has been heavily over-stamped with the W/iD at some point, and also has had the WD surmounted by the /i (the two standard military forms of this marking that are usually encountered) stamped near the top. 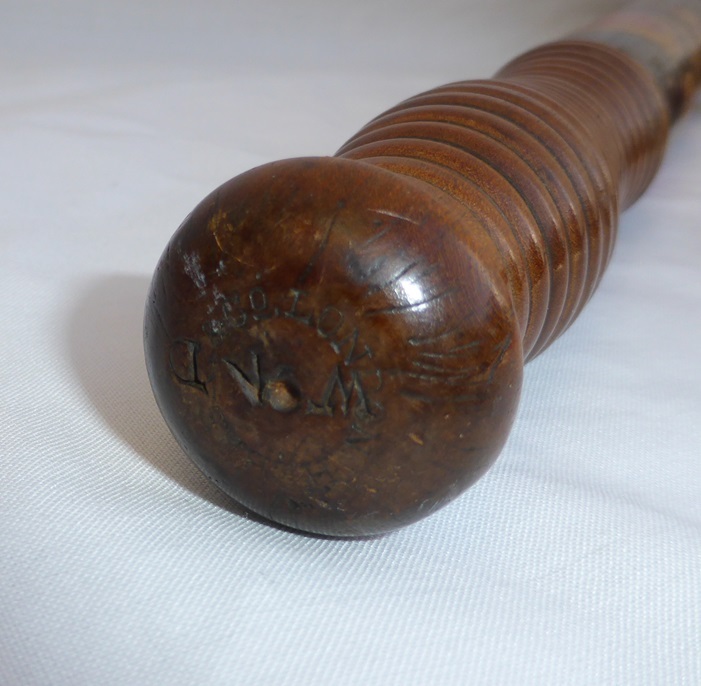 Given that the Metropolitan Police made carrying the shorter 15 inch truncheons in a long trouser pocket the norm in 1887 (as part of the change-over from carrying it in a truncheon case on the belt), it is my conjecture that some use was found for the now obsolete longer pattern. Giving them to the military (who, as you point out, rarely used them) would thus make logical sense. re-issued. My own truncheon was a lignum vitae one fron the 1880's. Well? What did you find out from the Heritage Centre? I'm willing to bet that your truncheon was used by the Metropolitan Police, and not associated with any dockyard agency. In his book on truncheons, Alan Cook reminds us that the Defense Ministry inspected as much of the Met's equipment that they could lay their hands on in 1884, and left the ubiquitous WD Broad-Arrow stamp on everything. This thread is four years old now. What else have you scored for your collection. Let's have some more pictures!